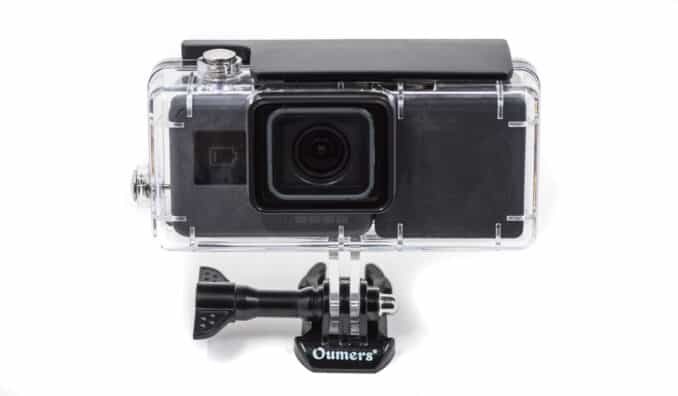 If you're after an extended battery for the GoPro HERO7, HERO6, or HERO5 Black that's waterproof, the new Oumers Side Power is one of the few options available. 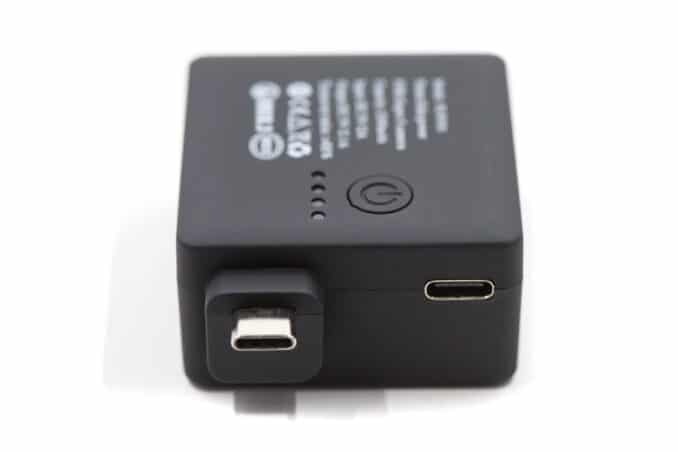 A number of the older models of GoPros had a connection port on the back of the camera that could be used to attach a battery, and GoPro had their own extended battery solution called the BacPac that did just that. But the HERO5 Black and HERO6 Black don't have that port, so they're not compatible with the BacPac accessories. Instead, the extended battery solutions have to plug into the USB-C port on the side of the camera. GoPro hasn't released its own extended battery for these models so far, but after-market brands have started to. Wasabi Power was first out of the gate. Their simply titled Extended Battery added a little extra width but pushed most of the design to behind the camera, blocking the camera's back screen. And they couldn't get a waterproof housing ready in time, so for now it's only available with a non-waterproof frame housing. There's a new option now available under the Oumers brand (not one I've heard of before) called the Side Power (model FLW501). It too plugs into the USB-C port on the side of the camera, but instead of wrapping around the back of the camera, it sits to the side. So you can still see the screen. And its distinctive feature is that it comes with a waterproof housing from the get-go. It's not a particularly pretty solution, and there are definite downsides in this implementation. The result is quite wide and turns it into about the size of a standard compact camera. The back door of the housing is solid plastic, so while you can see the back screen, you can't use it with touch control (and voice control doesn't work well with it). And the extra battery adds extra heat in an enclosed space, which can be a problem in humid or damp conditions with fogging. A couple of sets of anti-fog inserts are included, but you'll probably want to pick up some more. The battery is rated for 2300mAh, which is almost double the capacity of the standard GoPro battery (1220mAh). And it's used in addition to the standard battery, meaning you get the battery life of both added together (although it's technically possible to use without the internal battery installed). On the right is a USB-C socket for plugging in the charging cable. The four blue LEDs on top are charge status indicators. In this shot, the USB-C plug that goes in to the side of the camera is at bottom covered in a protective black plastic cover that it's shipped with. The amount of time that will give you is going to vary based on various factors including the shooting mode you're using and even the outside temperature (lithium batteries perform poorly in very cold temperatures). But in general you reasonably expect to roughly triple your shooting time, give or take. The charging socket at right. The powering plug at left. It comes standard with a waterproof housing that's rated down to around 150 feet (45 meters). 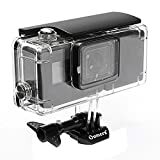 Aside from being unusually wide, it's basically the same as the waterproof housing in older models of GoPros, with the same kind of clamp clip on top and buttons. To attach the battery you'll need to clip off the side door. It's very easy to clip on an off. It's also very easy to lose--if you need new ones you can buy them as spare parts. To attach it to the camera, you remove the side door from the camera and slot the USB-C plug in. The camera+battery combination then simply slips into the housing just like normal. There's no special attachment or finicky finger gymnastics that some other extended batteries require. It works with the HERO6 Black and HERO5 Black. It won't work with other models, including older models or any of the Session models. If you ran into GoPro's nasty little surprise in its firmware a while back that prevented third-party batteries from working in their cameras, it's natural to wonder whether they might do that again. I don't have a definitive answer, and it's impossible to rule out, of course, but there's some degree of confidence of it not happening with this battery because it connects via the external USB-C port. The ones GoPro blocked previously with their firmware update were internal batteries. It works. As expected, the amount of extra time I get varies according to the usual factors, but I've been getting roughly triple the usual times before both batteries are flat. The housing seems solid and doesn't seem to have any obvious weak points, although I haven't taken it to depth to test how it does under water pressure. In snow and rain it has worked just fine. The unit I bought was new in a box, but the housing was still a bit scuffed--the kind of non-premium finish you often get from some of these after-market suppliers. It hasn't affected the performance, and the lens port itself is clean and clear, with the lens port and back panel both coming protected by a peel-off protector. When shooting in the high-end video modes, the HERO6 Black and HERO5 Black cameras get hot just by themselves. Enclosing them into a sealed housing that limits their ability to air cool makes that worse. While I haven't had the camera shut down from overheating when using the housing, there is definitely a higher risk of it doing so in some conditions. There's also a good chance of lens fogging if you're using it in humid or damp conditions or underwater, so using anti-fog inserts is a useful precaution.